Painted Perspective: "Pi" as in that mathematical symbol. "Pi" as in that mathematical symbol. ***Warning: "Life Of Pi" SPOILER ALERT. DO NOT READ IF YOU HAVE PLANS TO READ THIS MAGNIFICENT BOOK. *** You can view the trailer for the screen adaptation of this book though. First thoughts about the trailer: A promising visual treat, but will it live up to the essence of the novel? My brother brought home "Life of Pi" by Yann Martel. The first thing I did after waking up in the morning was read this novel because I've been absolutely dying to read it. I didn't stop reading even when I had skipped breakfast and lunch. That's how good it is. I finished reading it in a few hours. And I was hungover from the book for the next few hours because the end just BOGGLES YOUR MIND. I mean, a little boy and a tiger stuck with each other in a lifeboat after their ship sunk? The book reviews on Amazon fall into two schools: people who actually read the whole thing and immensely enjoyed it, and people who couldn't even go halfway and decide it's fair to give the novel a miserable review and one star rating. 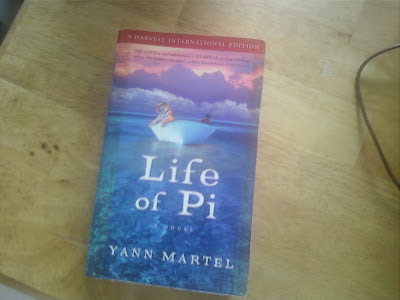 *It gives a colorful narrative of Pi's relationship with animals (his family owns a zoo) and his exploration of faith. *Great foreshadowing on the "man vs nature" theme that takes place after the shipwreck. Overall, it's beautifully written, provocative novel about acceptance, spirituality, grief, survival, and truth. I kinda spoiled the plot twist to my brother a few days ago. I lamented: "OMG, Pi is the tiger! PI IS THE TIGER!" My bro: WTF??? I'm not done with the book yet! If it has an Indian protagonist, it should be good. Haha racial bias aside, though, I'm really looking forward to this film. Think I can borrow the book from you? Lol sorry, the book isn't mine. It belongs to my brother's best friend.